Damn son there's a lot of great writing here! I'm interested to know how you financed all those transfers other than Wilshere's move. Not a great start but if you fix the defence then you'll do really well with the attacking talent. It always used to be Wenger v Alex Ferguson, one of the biggest managerial rivalries in English football, but now – Corey Eaton-McKnight will step out of the Old Trafford tunnel for the first time, taking on the Dutch maestro, in the name of Louis Van Gaal. The game notorious for Keane v Viera, it has always been a hugely tense, action packed and tight affair, with tackles flying in left, right and centre. This game makes it no more as important, with the Gunner’s spending spree on near enough a whole new team, in the process spending near enough 200 million in one window not all players having settled in yet they lie in 8th place, but there have been some promising performances so far from the team. Following away success at Stamford Bridge and Anfield, the North London based club will be hoping to make it a treble over the big Premier League sides – although having played the Red Devils’ rivals twice already this season losing both it could be a haunting place for Arsenal. Although, in real life the form at Old Trafford is quite simple, one word to describe it – shocking. In the Barclays Premier League they’ve only recorded three wins at Old Trafford, and haven’t gained one in eight long years. Manchester United head into the game, sitting in a happy 5th place, only four points behind Chelsea who sit in top place, a win here and they are right within a shout for regaining the title, despite only 12 games played there is still room for quite a lot of change to the table. 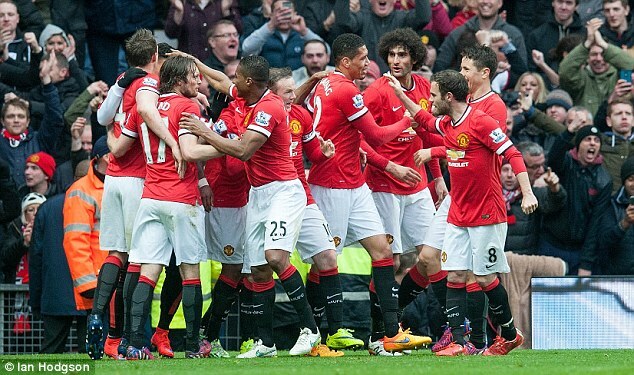 United are formidable at home against Arsenal, with about 14 wins at the Theatre Of Dreams. The most recognisable win of recent times, will of course be that massive 8-2 score line back in 2011. Then, for United scoring was Danny Welbeck who will now be running out for the visitors. If there is to be a major miss for Manchester United, it comes in the name of Wayne Rooney, the key striker is suspended for this clash – he is the top scorer in this rivalry, scoring nine goals in matches involved between these two, if they need a goal he would be the man to call for, but unfortunately they won’t be able to here. It’s a game every fan looks forward to, Its Manchester United against Arsenal and its LIVE next, with regular commentary updates throughout the game. So far so good, but with the signings you've made I really expected more. Your expectations should be silverware this season, at all costs. Commentary, a few touches away from finalized. The countdown is over, the bets have been placed, tickets have been sold, beers have been purchased, and downed numerous times over. The Sunday Roasts have been cooked, now on Sky Sports 1 and in High Definition. Manchester United v Arsenal kicks off. Now. Your commentators for this afternoon, Martin Tyler and Gary Neville. MT: "Yes, and thank you, welcome to Old Trafford the buzz inside the stadium is unreal, the atmosphere is out of the roof, I can barely hear myself talk, Gary". GN: "This game was always a joy to play in, the pre-match build up, everything about it, it was always a special game for me and one of those I looked forward to every year". "Now let me take you through the United line-up"
"Louis Van Gaal has set his troops up with an unfamiliar 4-1-2-1-2 looking formation, obviously without the suspend Rooney they have had to look for other forward options, and in that they have Memphis Depay playing more of a deep lying forward striker role, with Ander Herrera just behind, and Chicarito just in front. "With Rafael injured, it's a makeshift right back in the name of Daley Blind, with Evans partnering him - if Arsenal need somewhere to exploit to win this game, this should be it. 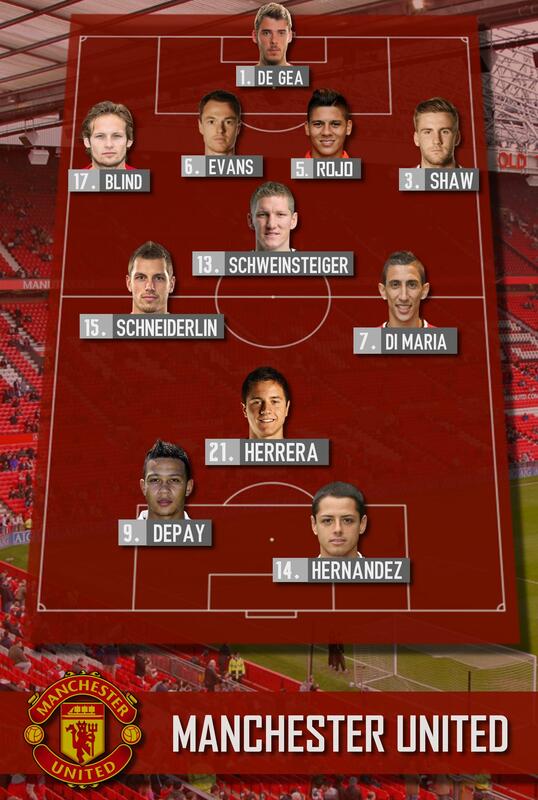 As expected, Rojo and Shaw fill up the other defensive positions. " "The midfield is where the quality is at for United, easily outclassing the opponents, there is a lot of quality and money in this midfield, costing over £100 million alone". Bastian Schweinsteiger holding that midfield together, with Angel Di Maria and Morgan Schneiderlin at central midfield, although I am surprised to see Bastian playing deep and not more attacking"
"Now for Martin to take you through the Arsenal Line up"
"Missing big Victor Wanyama will be a huge loss for Arsenal in the side today, the side will be much weaker and vulnerable without him, Iturraspe replaces him in the defensive midfield role. Playing as the regista/anchor man of the team." "The midfield, compared to United's does look a lot more weaker, with Aaron Ramsey and Mesut Ozil in the centre of the park, with the German midfielder playing slightly more forward. "Petr Cech will play in goal, for Arsenal, returning from a slight knock against Swansea"
"In defence, Baines returns from injury which is a massive bonus for Eaton-McKnight, who had to play Gabriel at LB in his last outing, there is no room for Bonucci in the side either as Per Mertesacker and Laurent Koscienly feature partnering each other, in such a big game this is vital as they will know each other very well. The defence will be finished off with Debuchy at right back"
"With Alexandre Lacazette being dropped to the bench following some dismal performances in the last few weeks, Alexis Sanchez takes the striker role for this game, Giroud features on the bench where he has been for the majority of the season"
"The expensive Marco Reus starts on the left wing, with Theo Walcott on the right - both having pace and skill to beat the United defence, where they are most inexperienced"
0 – The teams are out, the Barclays Premier League theme tune has been played in the backdrop, and the home side have won the toss and have decided to kick-off, shooting towards the Stretford End. 3 – Very defensive start from Arsenal so far, United getting crosses into the box but Per Mertesacker dealing with everything which gets near him. 4 – Koscienly gives away a needless free-kick - Di Maria played short to Hernandez, wasteful and cleared. 15 – Good interchanging play between Theo Walcott and Alexis Sanchez, eventually forcing a corner, Walcott delivered but couldn’t find a head on the ball in the area – cleared. 21 – Manchester United with a chance to go ahead, Depay played a through ball to Herrea, just inside the 18 yard area – Petr Cech comes to the rescue, tipping ball around post. 25 – Hernandez intercepted a lofted ball played over the top, through on goal destined to score - in an offside position - Arsenal fans breathe a sigh of relief. Who else would it be? 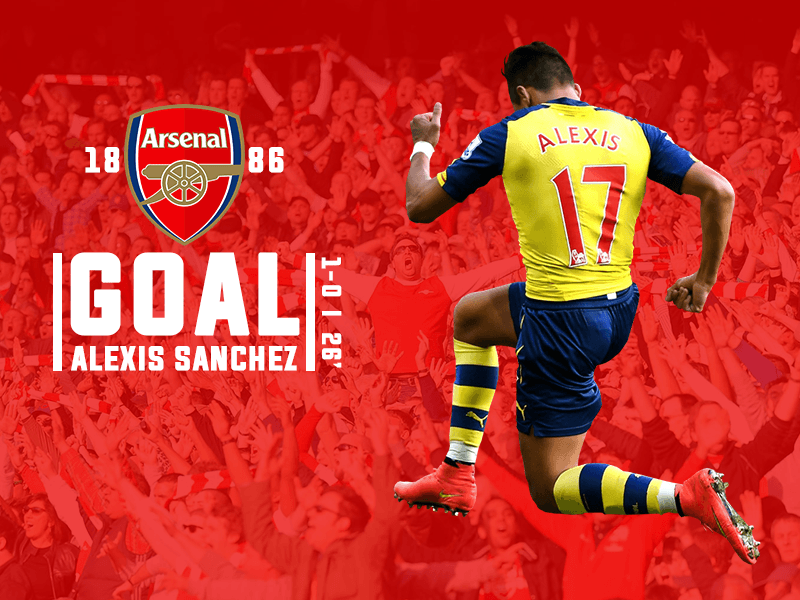 Arsenal's top scorer is in a rich vein of form at the moment, everything he his turns into a goal. Schneiderlin at fault, Leighton Baines played a short ball from the wing into the box finding Marco Reus, playing the ball across the goal for Sanchez to poke home, De Gea going the other way and no two defenders surrounding couldn’t get a foot in. 29 – United desperate to get straight back into the game Tturraspe fouled Schneiderlin outside edge of area. Depay takes the free kick but sends it high and sailing. 37 – UNITED LIFELINE. Iturraspe is having an awful game, another error by the young Spaniard, he fouled Herrera inside the area. Referee Roger East points to the spot. Penalty given. Players crowd East, nothing is changing his mind. Schweinsteiger kept his cool, buried the penalty with ease, smashing the penalty to the keepers right, Cech went completely the wrong way. Iturraspe has been such a reliability for Arsenal in this game, he'c cost them dearly on what was a great first half performance other than that, it was the best to replace him at half time. The change will see Ramsey become more defensive. Pushing Cazorla and Ozil slightly more forward. 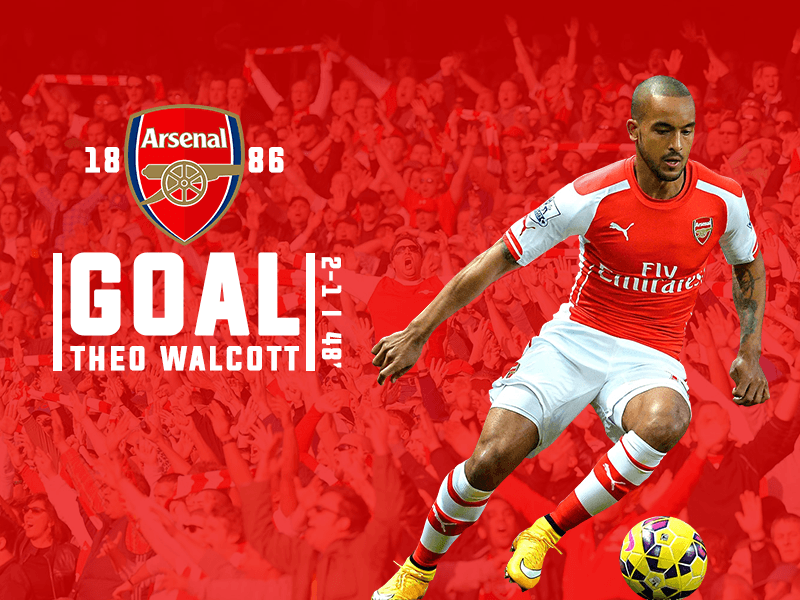 Theo Walcott!! One of the managers most liked players in the team, he's played an integral role all season - the right winger, makeshift striker when needed. A real poachers effort from 11 yards side; it seems the substitution made the difference, a similar goal from the first – Mathieu Debuchy found Santi Cazorla in acres of space placed through Walcott who was waiting, with the defence at a standstill paced ahead and scored. What a start to the second half for Arsenal. 51 – Sanchez MISSED A SITTER – Debuchy lumped a ball up field, with Sanchez chasing disposed Marcos Rojo, one on one mis-hit a chance, easier to miss than score and it was blazed over the bar. Golden opportunity to further extend the lead. With not much more action happening in the second half the game has seemed to die down a tad. Hernandez scores an equaliser, Out of nowhere Schweinsteiger finds Blind who knocks the ball into the front post for Hernandez to turn and score. 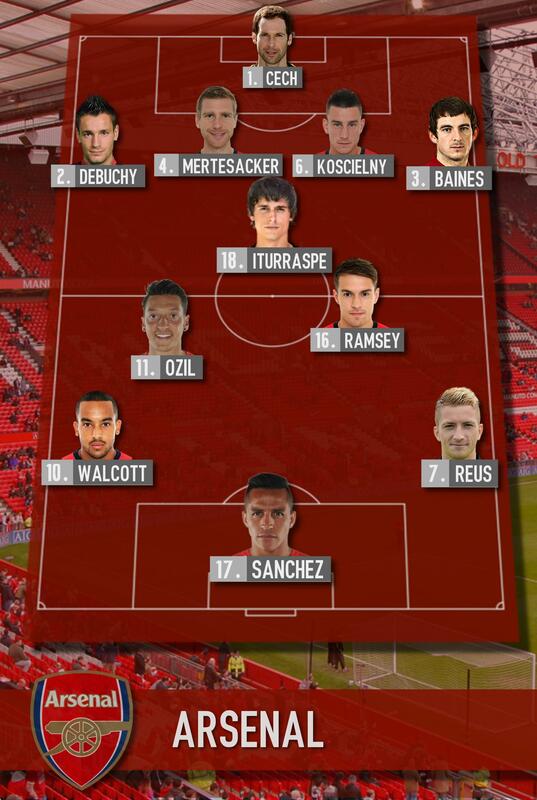 Tactical change, Sanchez switched from striker to right wing. Oliver Giroud comes on for only his fourth game this season, hoping the aerial presence will help find a winner. 78 – United look dominant better side now in second half, most likely team to score numerous little chances, but not worthy reporting on. 80 – Reus delivers short free-kick falls to Ozil, shoots but De Gea clutches onto the ball well. 85 – Hernandez could’ve had his second goal…. But from close range misses a golden opportunity. 90+2 Giroud through on goal, from the side of the goalmouth, hits a shot but in offside position. 93. Roger East blows his whistle, full-time. Unused Subs; Lacazette, Bonucci, Britton, Welbeck. Unused Subs; Valdes (GK), Young, Valencia, Gaya. Man Of The Match - 4; Per Mertesacker; Absolute solid performance by the German giant, won everything that was near him and chucked at him, played with his heart on his sleeve and got stuck in when required. Referee: Roger East ; Had a good game, didn't stop start kept the game flowing, and when required done what was needed with no unnecessary bookings. Only downfall, soft penalty. Your team has one of the best passing success rates in the league right now, yet the results haven’t been as good as many would have hoped. What do you say to those who believe a change of approach will see a change of fortunes on the scoreboard? What did you think of the decision to award Man Utd a penalty? “I had better not say too much as I shall get in trouble otherwise, but I feel it was a soft call to make, but poor Ander [Iturraspe] weren’t having the best of games as it was, hence the half time sub. 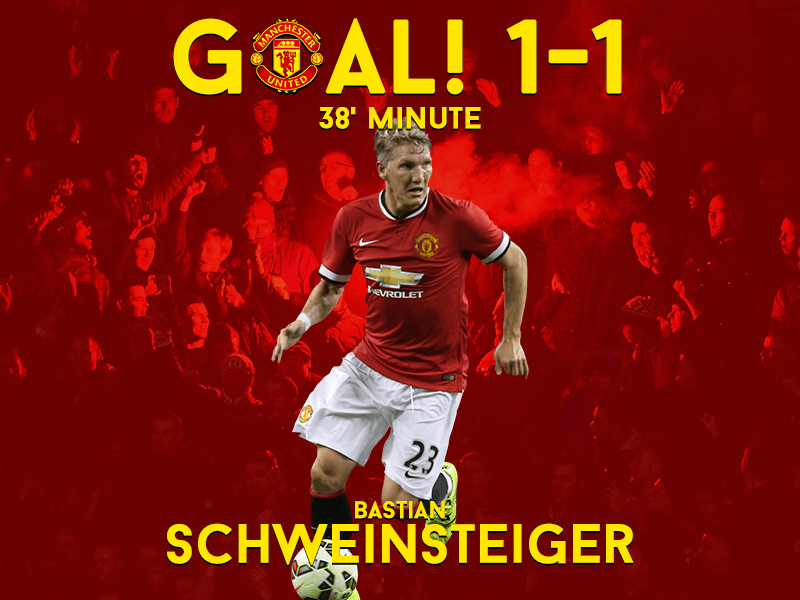 Bastian Schweinsteiger scored a penalty today after a mistake by Ander Iturraspe. How do you think the incident will affect your player? I would like to credit both ARSENAL_ruleZ and Zed for their help with graphics, without them this would not be as good, nor would it probably have happened! Not a bad result, shame to concede the equalizer but was always a tough game! Excellent start to what I think is your first story (? ), especially the last two updates! Good luck with Arsenal, as much as I hate to say it. 2015-07-30 16:08#217374 AlexTHFC : Excellent start to what I think is your first story (? ), especially the last two updates! Good luck with Arsenal, as much as I hate to say it. Cheers mate, yes, well I've apparently been a member since 2011, but have never came on here - this is the first story I've created, and actually stuck too. Those graphics are gorgeous! Good update too I suppose Just kidding, brilliant update too! You are reading "Arsenal FC - A new era begins". Handcrafted in Symi, Hellas. Page created in 0.524 seconds.